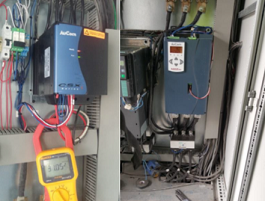 AuCom partner Powertronics have applied a mix of the latest soft start technology and existing products to keep a Mexican aggregate plant operating effectively. Construction aggregates, including sand, gravel, crushed stone, slag, and concrete are the most mined materials in the world. Aggregates are used for drainage, as the base material for foundations, roads, and railroads, and as a low-cost extender binder for expensive cement or asphalt. To produce aggregates of a useable quality, the raw minerals first need to be crushed. Although it sounds like the name of a James Bond villain, a ‘jaw crusher’ plays a pivotal role in the process of producing marketable aggregates. Jaw crushers apply mechanical pressure to aggregates to break up the particles into usable sizes. Powertronics is a Mexican-based engineering services company with over 30 years of experience in the industrial sector. They support mostly local industrial businesses by implementing integrated automation projects, industrial control, electrical installations, and power quality. They are a valued distributor of AuCom products. Recently a jaw crusher and belt conveyor at the Cypsa Vise “El Sauz” aggregate plant in Guanajuato, México experienced issues due to faulty soft starters. 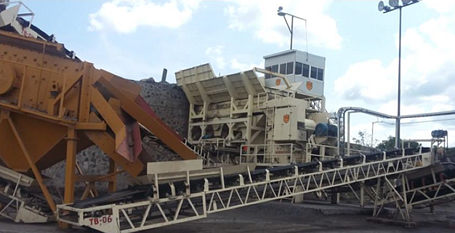 The jaw crusher has a motor rated 250 HP (296 Amps, 460 VAC), and the belt conveyor a motor rated 50 HP (58.2 Amps, 460 VAC). The aggregate plant was in need of reliable soft starters to reduce pressure on the machinery and also increase productivity of aggregate processing. Powertronics delivered a retrofit motor control solution for the plant, featuring the new EMX4i soft starter for the jaw crusher and CSXi soft starter for the conveyor belt. The EMX4i soft starter provides advanced control and protection for the jaw crusher’s 250HP motor, while AuCom’s compact CSXi soft starter manages the 50HP conveyor. The EMX4i is an ideal solution for crusher applications. It of course reduces the current required at motor start, minimising stress on the often remote power supply of mining and aggregate sites. But the EMX4i’s motor thermal model also maximises productivity by allowing safe use of the motor’s full capacity without nuisance tripping. With a small footprint as a key design feature, the new EMX4i is a perfect fit for retrofit applications where space is at a premium. Cypsa Vise “El Sauz” aggregate plant is now back to full production capacity and operating more efficiently than ever.